The many challenges faced by Makana Municipality are public knowledge. A debt of about R150 million, a large portion of which comprises outstanding debt owed to the Municipality by citizens and businesses. Eskom and Amatola Water are some of the Municipality’s biggest creditors. While the municipal area is currently experiencing a devastating drought the City’s internal water reticulation infrastructure needs massive restoration. At a recent meeting between the Concerned Citizens Committee to Save Makana of which the GBF is a member, the Office of the Premier agreed to the appointment of a turnaround specialist who would be tasked to work with the Makana Council and officials to turn our Municipality around. While there is agreement among all roleplayers to what the issues and challenges are, solutions have to be devised and plans implemented in order to make a difference. The GBF is grateful to the Office of the Premier for their continued engagement in and support of Makana Municipality. Prior to this year’s National Arts Festival the Province supported the development of the infrastructure through a grant of R6.5 million, thereby ensuring a stable and constant supply of water for the duration of the Festival. Another R10 million was donated by the Premiers office towards Festival to cover the shortage that emerged when the Lotto did not honour their sponsorship. Other positive developments include the appointment of a Director of Corporate Services and the allocation of a Municipal Infrastructure Grant. 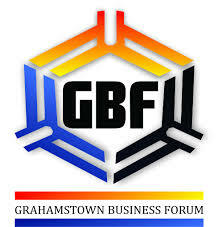 The Grahamstown Business Forum endeavours to create and sustain a supportive and enabling business environment in Grahamstown. The GBF is about assisting the Municipality by first seeking to understand rather than to be understood. The organisation stands firm in the belief that an approach of constructive engagement with local and provincial government along with other role-players would be more productive. In addition to working with local government, the GBF is involved with projects aimed at enhancing the quality of life of residents and business owners. Business Development, one of the primary aims of the organisation, is done through our association with the Assumption Development Centre (ADC) in Joza, where the development of entrepreneurs is seen as key to reviving the township economy. Apart from being represented on the ADC’s board, the GBF supports the ADC’s entrepreneurial development programme by soliciting local businessmen and women to act as mentors for the participants of their courses. The GBF also has representation on the Makana Mayor’s Finance Committee. The GBF is equally proud to be associated with the Creative City initiative, of which the overall marketing objective is for Grahamstown to become South Africa’s Creative Capital by 2020. A Creative City is best described as a city with cultural activities which are an integral component of the city’s economic and social functioning, high concentrations of creative employment, and attractive to inward investment because of their well-established cultural facilities. The objective is to create jobs within creative industries to boost the economy of the town. Grahamstown Business Forum will continue to work with the Mayor, the Office of the Premier, and other organisations to ensure Grahamstown residents and business owners not only realise Grahamstown’s full potential, but also benefit from a well-functioning City. Trevor Davies is on the committee of the Grahamstown Business Forum.